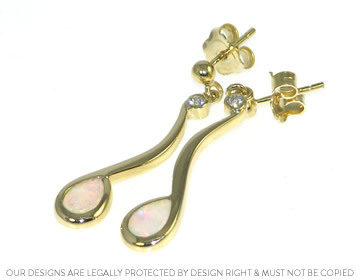 David and Fiona wanted us to design a special pair of earrings to match Fiona's opal pendant. The 18ct yellow gold earrings hold a pair of 7x5mm pear cut Opals with two 2mm brilliant cut diamonds. The total length of the earrings is 36mm long with a highly polished finish.